Raise your own bees with this starter beekeeping kit. 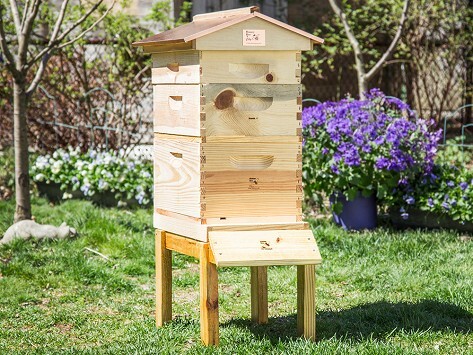 Each wooden hive is Made in the USA and is ideal for urban spaces—like small backyards or roof decks. Stack the modular components, and the bees will seal it up with a byproduct of their honey making—there’s no need for nails. A copper roof protects the hive from the elements, and a clear panel lets you peek in on the action. Once the hive is set up, order your own colony of bees, and soon it will be buzzing with activity. I am a Beekeeper and wanted to see all of the different kinds of bee hives made through out the US. This was the perfect beginner set. Everything came pre-assembled, lacquered (for protection), and ready to go!